Here at Wise Bread, we like to talk about building wealth over the long term. But what if you want to be worth more tomorrow than you are today? There are plenty of ways to make a quick buck, but more importantly there are easy ways to build your overall net worth in a single day. Here are a dozen ways that you can bolster your financial situation in quick order. This is not a guarantee. But on any given day, the stock market is more likely to go up than down. In the last decade, there have been about 2,500 trading days. Of those, the S&P 500 — the index that tracks the performance of the biggest companies — has finished up more than 1,300 times. So about 55% of the time, if you invest in a fund that mirrors the S&P 500, you'll make money in a single day. One of the nice things about having some money in the bank is that you can make money by simply doing nothing. If you manage to get through a day without spending a dime — no runs to Starbucks, no impulse buys on Amazon — you'll have increased your net worth simply because your cash is earning interest. These days, it's relatively easy to find buyers for things you don't need. Consider using Craigslist or eBay to sell your unwanted items. You'd be surprised how many people have made decent side incomes just by selling things online. If you don't want to go the Internet route, you may be able to get cash for your items at consignment shops or used book stores. With interest rates still historically low, it may be a good time to examine whether you can save money on your house payments. A lower interest rate means more money available to pay off the house earlier, or invest. Any money that's not being used to pay back the bank is money that can be used to make you wealthier. There are two ways to boost your net worth. One is to increase your income. The other is to cut down on the amount you owe. So if you can reduce or eliminate a debt, your net worth will be immediately higher, even if you don't earn any more money. Here's another way to make a quick buck or two: When a friend or neighbor goes out of town, offer to water their plants, keep an eye out for mail and packages, and generally make sure their house is okay. Did you know that there are billions of dollars in unclaimed property? It's often things like insurance claim money, or perhaps even an inheritance from a long-lost relative. Most states keep a database of such items, or you can also check MissingMoney.com or NAUPA. Your wealth and assets are worth more if they are protected. Being properly insured means that you can financially withstand everything from lawsuits to landslides and medical emergencies. Having a solid homeowners policy will protect you from financial ruin if your house gets hit by a tornado, volcano, or run-of-the-mill thunderstorm. Auto insurance will protect you if you crash your car. Health insurance will keep you from going bankrupt due to the injuries from that car crash. Life insurance will ensure your family is okay if you pass away unexpectedly, and some life insurance policies also have a cash value and will contribute to your net worth. Relax, I am not talking about the world's oldest profession. But you can make a few bucks by donating your plasma, your hair, or taking part in medical trials. Check with your local Red Cross headquarters for blood donation information, and also go to sites such as ClinicalConnection. (See also: How to Sell Your Hair for Cash). Wait, you can become richer by giving something away? It may not have an immediate impact on your bank account, but most charitable donations are tax-deductible, meaning that you can reduce your taxable income and keep more of your hard-earned cash. Look to donate big ticket items like used cars or even real estate. 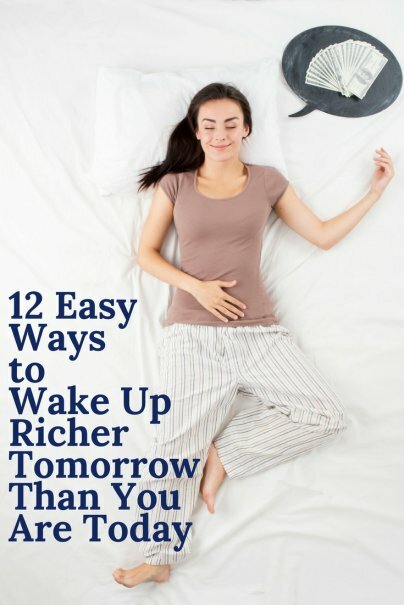 What are you doing today to become richer tomorrow?